If you're a gamer and looking to get into VR this year, there's one big question you should be asking yourself: Oculus Rift or HTC Vive? You can also weigh the pros and cons of PlayStation VR, but assuming you don't own a PS4, this is the versus for you. Based on usage since their releases, we've compared the two headsets, looking at design, comfort, displays, tracking, controllers, audio, setup and games. For many, we're sure deciding on a headset will be made based on the factors mentioned above and of course the big one: price. The arrival of Oculus Touch controllers and full room-scale with Rift have definitely changed the overall experience, bringing it much closer to Vive's offering. If you are still open to being swayed one way or another, check out our in-depth versus feature below. Let us know anything we've missed or extra considerations in the comments. Both the Oculus Rift and the HTC Vive look and feel much, much better than their very first iterations. Both VR headsets now feel like actual products, not proof-of-concepts. The consumer Oculus Rift is light enough to be comfortable (it looks heavier than it is) and the extra ventilation added to the headset makes it less of a sweat fest. The HDMI/USB cables are now housed in a single cord and the harness has also been modified so the straps look ever so slightly less dorky. The straps themselves are also easily adjustable thanks to the simple velcro system on the sides and top of your head. It's now covered in a fine fabric, there's a removable fascia and there's a bit more room for glasses – though it's not the easiest to put on if you have large specs. An adjustable dial accounts for different distances between users' eyes, and the weight distribution is more centred so you don't feel like the accessory is off balance. The HTC Vive isn't radically different in design – they are both essentially black boxes with straps. While the Vive is much smaller and lighter than its previous iterations, it still remains larger and slightly heavier than the Rift headset. You'll find no cloth on the front of the Vive. Instead, it has a matte finish with black plastic and the front of the headset houses a bunch of sensors plus a front-facing camera. Again, it's lighter than it looks and sounds so don't let this put you off. The Vive is also glasses friendly – even more so than the Rift. There are notches on the sides of its face foam that allow spectacles to slide in more easily than with the Rift, and there's also another set of squishy foam you can stick in if the other doesn't quite fit your face right. The straps aren't as refined as the ones on Oculus Rift, but they get the job done with two adjustable side pieces of velcro. The one on top is a little obstructed by the fat cord but with some finesse, you can readjust it as well. Because of all the foam on both, the headsets sit comfortably on the face, and the weight is hardly noticeable on either. Since you'll be sitting or standing with Rift, there are no problems with sweat or it feeling heavy over time. It may feel a bit warm if you wear it for hours and you'll get indentations on your cheeks, but that seems to be about it. With Vive, walking around, ducking, turning and so forth may take a toll and make the headset feel overly sweaty and possibly cumbersome after several hours. Oculus Rift definitely wins for its sleek design and easy-to-use head straps. HTC Vive wins for glasses wearing comfort. That said, overall comfort is a toss up. Since you're just sitting with the Rift, games can last much longer without needing to take it off. With the Vive, we'll have to remove it if it's a particularly rigorous game so we can take a break. Let's start with the stats. Both the Oculus Rift and HTC Vive have two OLED displays with a total resolution of 2160 x 1200 and a 90Hz refresh rate – which is apparently 233 million pixels a second and the minimum spec to keep you from spewing everywhere. An added bonus is that the Vive's screen ratio is 9:5, not 16:9, which means you get a taller field of view. Horizontally, both headsets offer a 110 degree field of view. The dreaded screen door effect, where you see lines in between the pixels, isn't super noticeable in either display, but you can catch glimpses on occasion (if you're looking really hard). Latency hasn't been a problem either. Whether you'll feel sick or not is really dependent on the game. Tie. You're not going to see huge differences between the headsets unless you really look for it. Maybe if you've shelled out extra cash for a high-end GPU and CPU, but in general, both provide sharp image quality. Your computer does the graphical heavy lifting with both headsets so what's important in terms of hardware, apart from the displays, is the tracking tech. A big selling point for Vive is the room-scale VR which can track all your movements – head, hands, body – over a 15 x 15 foot space. That means you can duck, dive and turn around in a virtual space but also means it might make more sense to stand up as you play. This won't work for everyone, or every game, but being able to walk around a ship/planet/lab is kind of magical. You also have the option to sit or play in a smaller space which can be configured in the initial setup screen, or later on should you need to. Oculus can do this with its tracking system in a 5 x 5 foot space, and it initially released with mostly sitting or standing experiences. The Oculus Rift headset comes bundled with a positional tracking sensor that sits on your desk (looking like a microphone) and monitors your movements. It does this by tracking the infrared LEDs – what Oculus calls its Constellation Tracking System – embedded all the way round the headset so you can look behind you in VR. If you bought the Touch controllers, you'll get an extra sensor to allow room-scale tracking with the Rift. Similar to Vive's sensors, the Rift ones will be able to see a much larger space - 7 x 5ft to be exact. A third $79 sensor can be added for full 360-degree tracking, allowing a larger 8 x 8ft space to be tracked. Even without the third sensor, the two work well making Rift a much more immersive, well rounded experience. One real hardware difference is that the Vive features a front facing passthrough camera to allow its Chaperone software to work. This allows you to see a fuzzy blue outline of objects in front of you, and people in the same room, at the touch of a button. It's helpful in keeping you from bumping into walls (more on that in a second). Rift has its own Chaperone called the Guardian System. It's the same concept where a blue grid pops up if you're out of the designated play area. However there have been a few instances where Rift's grid pops up but we've still run into a chair or wall. That's not to say we've been completely wall-proof with Vive – just less so. Chaperone works a bit better here since the front facing camera actually lets you see what you're going to hit more often than not. So far, Vive's sensors have been able to keep up with fast movements like shooting arrows, sword fighting and building things (The Lab, Vanishing Realms and Fantastic Contraption). Rift has done an equally good job here too but this is where the third sensor would come in handy. Generally, it's capable of realising what you want to do if reaching behind you – or if you're not facing a sensor. Though on a few occasions, it hasn't been able to pick up on those movements. A third sensor placed facing the other two would complete the room-scale and likely help. The HTC Vive houses an accelerometer and gyrosensor, two laser position sensors (or Lighthouse stations) and tracks your head movements with 32 LED sensors on the headset itself. So you don't need another sensor behind you because of the Vive's headset. HTC Vive's tracking is better if you're only going with Oculus Rift's two sensors. With a third, it's more equally matched. In general, both tracked well – there's a slight chance Rift won't pick up every single movement, but with two sensors you can still enjoy room-scale. If you're lacking space, tracking for Vive won't go well as there are some games that require a lot of room. Unless you opt for mostly sitting or standing experiences in Vive, then Rift still seems to be the best option for tight quarters if you want the best of both worlds. But you'll still need to move some furniture aside for more space to use Rift room-scale. Oculus and Vive can both be played with traditional controllers, and the Rift comes bundled with an Xbox One controller. Now with Oculus Touch out, we can finally add our two cents about the highly anticipated controllers. It's safe to say Touch has met our expectations. The smaller, lighter half-moon design lets you do pointing and thumbs-up gestures as the controller's sensors are able to pick up the slightest movements. There are also three buttons on each controller with X, Y and menu buttons on the left and A, B and the universal Oculus menu button on the right. The full range includes a clickable thumb stick, a trigger for your forefinger and a touchpad button for the three remaining fingers to grab and hold. There are also haptics that buzz when you do certain things in-game. The controllers run off one AA battery each, so there's no need to recharge after usage – though you'll have to invest in batteries for the future. While some games take getting used to with Touch, the overall experience is intuitive and easy to use, especially for people already used to gamepads. The two (also wireless) Vive controllers are larger and a bit more unwieldy, with a slight learning curve involved because of the touchpads. That said, it hasn't taken long to get used to them. The controllers come with haptic feedback, dual stage trigger buttons along with the aforementioned circular, pressure sensitive touchpads. So far, the Vive controllers have been responsive, tracked well and have been durable in gameplay – even after some violent rounds of #SelfieTennis. Our hands have another story to tell, though. This one previously went to the HTC Vive since Touch wasn't out yet. However with Touch available, it's clear that the Oculus device is just ahead. Performance isn't an issue with either controller – both have tracked well and work fine. Ergonomically, Rift's Touch controllers make more sense in the hand and you get a wider range of gestures. You can't use all your fingers or whole hand, but it's more than the Vive offers. Another way headset makers can add to the immersive experience is audio. Oculus has its Head-Related Transfer Tech (HRTF) which combines with the Rift's head tracking to create spatial, 3D audio. It's impressive in use and gives the impression that you are surrounded, in 360 degrees, by sound. An Oculus Audio SDK gives developers the chance to take advantage of the software but again, it's not guaranteed for every title. HTC didn't package up nice headphones like Oculus did but you do get decent earbuds in the package. They're not on a particularly long wire which is good since you're already dealing with lots of long cables. For Rift, you can also pick up a pair of Oculus Earphones. They're basically just earbuds that can attach to the Rift if you want an in-ear experience. We thought they were solid earbuds but not really worth spending another $49 when the default ear pads are already great. Additionally both headsets let you switch out their hardware for your own set of headphones – which you may have to do with the Vive if the earbuds aren't cutting it. Oculus Rift wins for audio, because man, does it sound incredible. Two big thumbs up to Oculus for making its tiny headphones blast so much sound into your ears, all the while making you think it's coming from all sorts of directions. HTC Vive earbuds, while good, don't do a great job blocking out ambient noise. Also, having to spend even more money on bigger ear cans is just downright annoying. Right off the bat, Oculus came bundled with the multiplayer space shooter EVE: Valkyrie from CCP Games, which is damn high profile in VR terms, as well as Lucky's Tale, a platformer from Playful. In terms of mainstream Oculus titles, see also Rock Band VR, the gorgeous, (exclusive) cliff-scaling game The Climb from Crytek, the intense-looking (and also exclusive) Edge Of Nowhere, Chronos, and smaller titles like the multiplayer Keep Talking And Nobody Explodes. Epic Games' Bullet Train is an awesome FPS that uses Oculus Touch nicely and The Witness, from the maker of Braid, is also on the horizon. There are other exclusives like ones from Insomniac Studios, Feral Rites, which uses the Xbox One controller and promises to be a fun exploration/fighting game, and The Unspoken which uses Touch controllers to turn you into a wizard. With the release of Touch, the Oculus Store is now jam-packed with even more games – over 50 – that use room-scale and the controllers. You also get the familiar Steam titles like Fantastic Contraption, The Gallery: Call Of The Starseed, Job Simulator and more. So despite the controversy over exclusive titles, the Oculus collection has done well in creating well-rounded experiences with full stories that leave you satisfied. You're not looking at the 10 hours and more kind of gaming, but they're much longer than an average demo. Speaking of demos, despite Valve's large library most of the games are short and often leave you wanting. Finished titles like #SelfieTennis and Cloudlands: Mini Golf are more like mini-games and, while fun, aren't exactly fulfilling. With your Vive purchase, you do get Job Simulator and Fantastic Contraption while The Lab is free to download. All of them are great but again, they give off mini-game vibes (heck, both Job Simulator and The Lab are basically comprised of smaller games). There are promises of installments like The Gallery: Call Of The Starseed and Vanishing Realms with longer gameplay down the line, but right now it's a bit lacking. Still, there are already fan favourites like Hover Junkers and Valve has updated The Lab with more content and better features. The most recent E3 has already given us teasers of what to expect for the Vive including Fallout 4 and Doom, due next year, which gives us hope for bigger experiences ahead. There's no clear winner in this category since it's dependent on what you're looking for. While the Steam VR library is definitely fattening up like the Oculus Store, there's still a smaller amount of full-fledged games for the Vive. Room-scale is an option for Rift now too so you'll get your pick of Touch/movement games along with sitting/gamepad titles. The price of an Oculus Rift is $599, which some people think is ludicrously high and others think is actually pretty great value. This includes the headset, the sensor, the remote control, the necessary cables, an Xbox One controller and two bundled games – EVE: Valkyrie and Lucky's Tale. Oculus Touch costs $199, and an optional third sensor for 360-degree tracking is an extra $79. Tally all that up and you'll likely get numbers closer to $850 with shipping factored in. You also get The Unspoken and VR Sports Challenge bundled with Touch. The HTC Vive headset costs £689 which is a good $200 more expensive than a singular Oculus Rift headset but does already include two controllers, the Lighthouse base stations and some earbuds plus copies of the games Job Simulator and Fantastic Contraption, while The Lab is free for everyone. HTC Vive takes the cake here. For a high price you get everything you need in one box. If you're willing to spend an extra $100 for Rift's whole bundle, then you're looking at an easier setup (more on that below). Setup marks a huge difference between the two headsets. As mentioned, the Oculus Rift doesn't need a lot of physical space – just 5 x 5ft – if you want to keep it to a seated experience. You're just looking at clearing out part or all of your desk to make room for the sensor. Then it's a matter of plugging in the sensor, headset and Xbox One adaptor which is followed by completing the setup through online prompts. With Touch controllers and a second sensor, you will need to pull a Vive and mark out more space. For Rift room-scale, 7 x 5ft is needed, though you can cut some corners when measuring it all out in the setup process. However, the more space you have, the better. HTC Vive can be simple enough to setup for some but for others, requires a lot more work. You'll have to clear out 15 x 15 feet of space, again give or take, and decide whether you want to drill holes in the wall for the base station sensors. If drilling holes isn't an option, then you'll still have to figure out where to put the sensors since they should be 16ft apart diagonally for an 11.5 play space, must angle down a certain amount and should be stable since they vibrate. Phew. Figuring out the PC setup is slightly easier. If you're building your own computer or upgrading, there are lists from each company you can follow. Oculus has published a list of recommended specifications and created a compatibility tool for Windows. You'll want an Intel i5-4590 (or more powerful) processor, an NVIDIA GTX 970 / AMD R9 290 graphics card or better, 8GB+ of RAM, a HDMI 1.3 output, 3x USB 3.0 ports and 1x USB 2.0 and you need to be running Windows 7 64-bit or later. However during Oculus Connect 3, the company announced it was lowering the spec requirements. Thanks to 'Asynchronous Spacewarp' tech, you'll need an Nvidia GTX 960 or greater, Intel i3-6100 / AMD FX4350 or greater, 8GB or more of RAM, compatible HDMI 1.3 video output, 1x USB 3.0 port and 2x USB 2.0 ports plus Windows 8 or newer for the operating system. 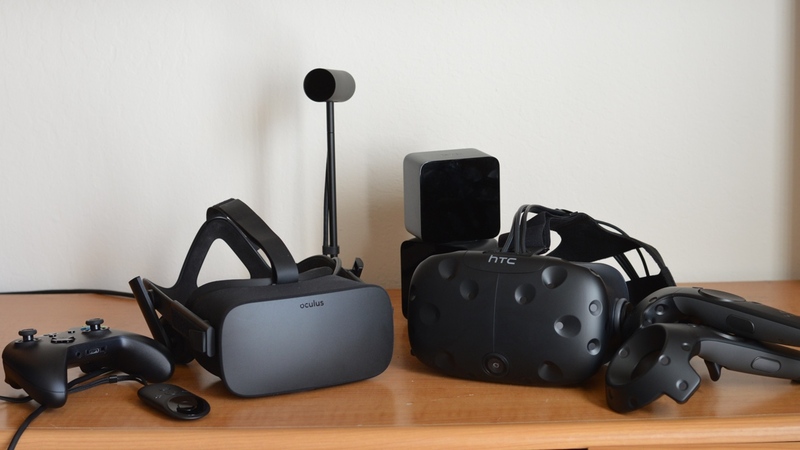 Valve and HTC also published their own list (albeit a lot later than Rift) with a SteamVR system compatibility check. For the most part, this list pretty much matches up with the one from Oculus: NVIDIA GeForce GTX 970 / AMD Radeon R9 290 equivalent or greater, Intel i5-4590 / AMD FX 8350 equivalent or greater, 4GB+ of RAM, HDMI 1.4 or DisplayPort 1.2 or newer, 1x USB 2.0 or greater port and finally Windows 7 SP1 or newer. You can definitely build a budget PC for VR that's under a grand, but if you're not willing to spend that time on it (or have the patience), there are options to buy compatible PCs as well. Setup here goes to Oculus, especially if you don't have a lot of room to spare. Granted, with Touch you'll still need to clear out a play area but it doesn't have to be massive. Oculus wins for PCs as well. Thanks to the lowered spec requirements, you won't have to upgrade and update everything to get the headset running smoothly. We decided to go with 'overall' instead of final verdict for a few reasons. Firstly, Oculus Rift was basically an incomplete product without Oculus Touch. We have a better idea of the overall experience it provides now that the controllers have made their way home, but that brings us to the second point: there is no actual 'winner' as to which VR headset is best. It's not a matter of pragmatism either, rather it's practicality. Oculus Rift is best for people who don't have a lot of room in their homes. It provides great games, solid head tracking and a comfortable experience. Just the headset alone will work fine but for more immersion, opting for Touch and room-scale will make all the difference. You'll need to figure out how to rearrange for room-scale though. HTC Vive asks the same and more from you to use its system. Along with rearranging your house, you'll have to account for accurately positioning the base stations to track you. If you can manage that, in addition to throwing your money in for an updated PC (which you'll have to do for Rift too) then you're left with a pretty incredible time in VR. In the end, it's a matter of what you're willing to sacrifice (money, time, walls without holes, etc) and whether you'd prefer to sit, stand or move around to get a glimpse of what the future of entertainment will be like. Let us know which headset you're leaning towards in the comments or on the Wareable Forum.